Been away a long time with illness but back now. Old Glory, not Old Glory 1, Magister Militum, Kalistra & Pendraken are the major players in 10mm figures. I don't think Old Glory does army packs, but I know the others do. & by Old Glory, I mean the Old Glory 25s company in the TMP manufacturers directory, not the Old Glory 15s company. Kalistra tends to be noticeably bigger than the rest. If you're going to stay with the 40mm x 20mm bases, the Old Glory figures that are on strips are only about 25mm or 30mm wide, so the base may look a bit sparse. Magister Militum has been coming out with a lot of new & unique troops and army types. 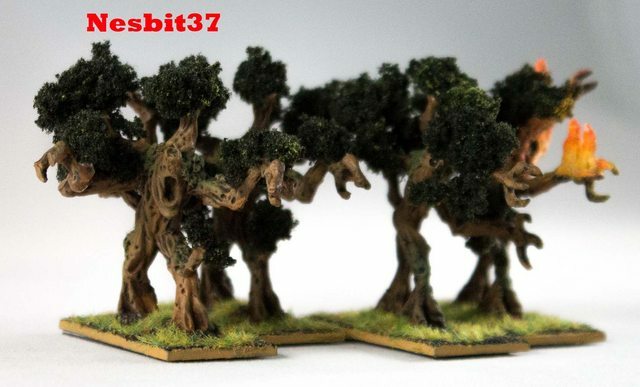 For 6mm, MicroWorld Games has a very nice & growing fantasy range. & with 6mm, you could keep the 40x20 bases & just use more figures, & have it look like a bigger battle. The game is 10mm fantasy figures. GWs I believe are a little larger but whatever. 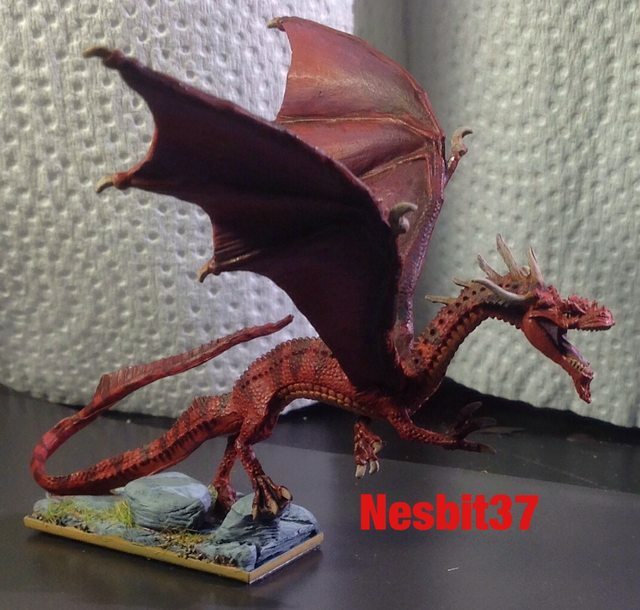 Copplestone castings have some great "not LotR" figures that would work fine for BoFA. Elves are missing so you would have to find them from another range. 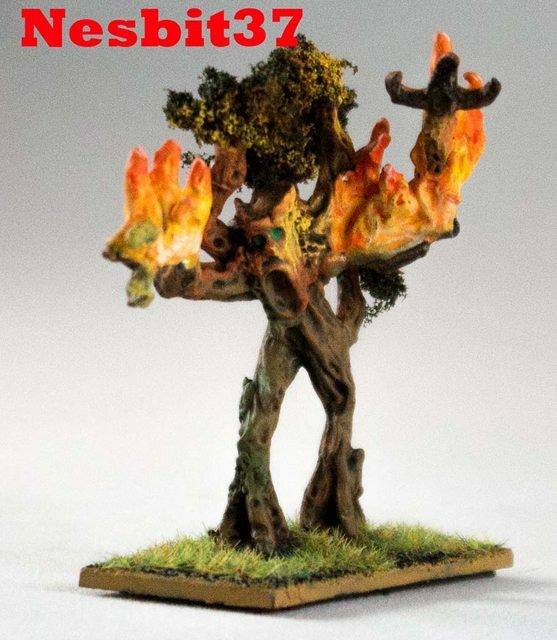 Copplestone Castings 10mm fantasy line is perfect, and quite obviously designed for gaming any Middle-Earth setting using the Bo5A rules (which, by the way, are essentially Warmaster rules). He doesn't yet offer elves, but his City men could stand in for those, with the Horse Tribes infantry becoming the Lakemen. He just added dwarves to the line as well. For Beorn you simply need a giant bear (or a 15mm bear), and many sources offer viable eagles, which again comes down to ignoring the stated scale of the manufacturer and just picking something that looks good to you. For additional critters like the spiders and bats, you also have lots of options. I like Splintered Lights bat swarm. 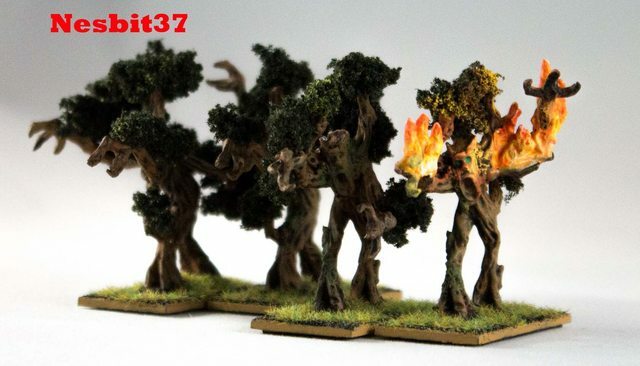 I also use Eureka's wood trolls as ents, though Splintered Light has some very nice options as well. Remember, size of fantasy creatures is relative. 15mm orcs and such could be 10mm ogres, and so on. It's a great game, and you have lots of options. Good luck and enjoy! EDIT Click on fantasy and then elf for the side bar selections. I think Parzival has it right. The horse lord infantry would make better Lake Men. Eureka has a 10mm line? They have a pretty fabulous 15/18mm elf line. Oh, those Eureka elves are nice. And the sculpt isn't far off matching the original Bo5A plastic elves, just with a more dynamic pose. You could use Copplestone's Horse Tribes infantry to represent the Lake men, and the City men that Joker posted above, as the Elves. Oops! I see that Parzival has already suggested this. I'd go 15mm, use Eureka minis for Orcs and Goblins and Elves. 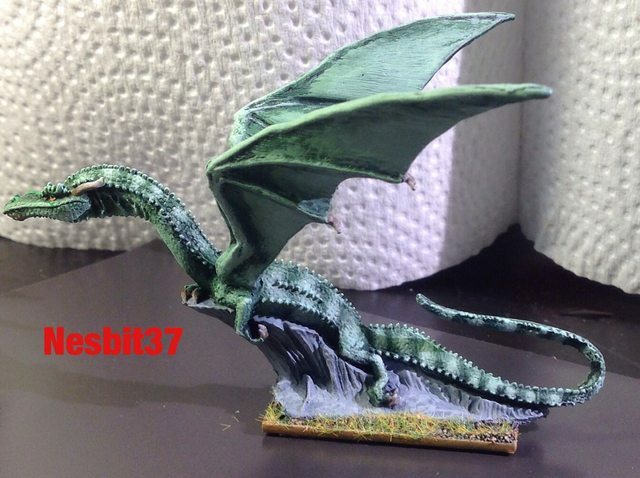 There are some great lines out there for 15mm Middle earth, ive got a very large collection of 15mm fantasy. There are lots of 10mm and 15mm lines to choose from, and a lot of them are pretty damned impressive. Two things to consider. First, remember there is a lot of scale creep between many lines so be careful about whose figs you try to mix together. Second, the main problem with putting together any fantasy game isn't finding suitable grunts, it's always finding suitable character figs that proves the most vexing. Start by sorting that problem first and work out from there. BTW there is a complete 5 Armies set up for sale in here in the Marketplace just now. Is that Kismet, or what! I've started a thread on my Sword & Spear forum about my own Battle of Five Armies project (in 15mm). I'm posting about which figures I'm using so this may be useful for you. 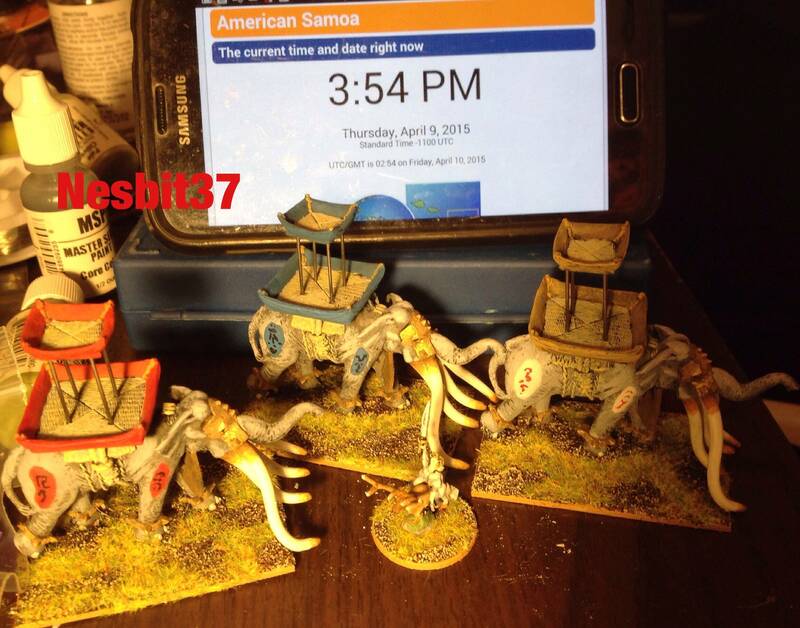 I've been doing a lot with 10mm lotr for playing Warmaster in Middle Earth. Its been fun finding some figures to do substitutions. 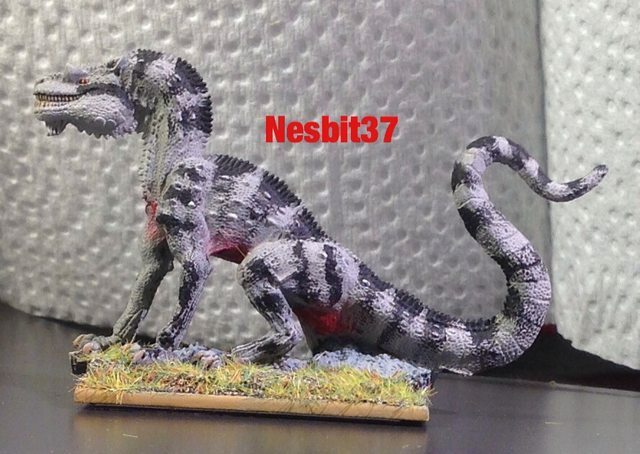 Here are a few I have found with images if I have painted them up. I just finished these guys. They are 15mm Picts from Cooplestone that I thought were perfect substitutes for half trolls if you wanted to copy the Games Workshop style for them (which I did). they are smaller than the troll miniatures by a decent amount, though they do look a little too big next to the BoFA plastic miniatures which are on the small side anyway. They look better and more in scale with the metal 10mm mini's I have found. 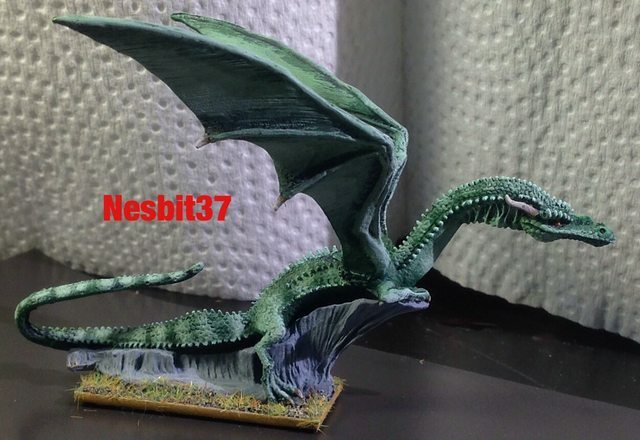 I know this thread hasn't been updated in a while but I figured I would add in image additions since the last post for anyone looking for more alternate (or existing) figures in the future for Battle of Five Armies 10mm.